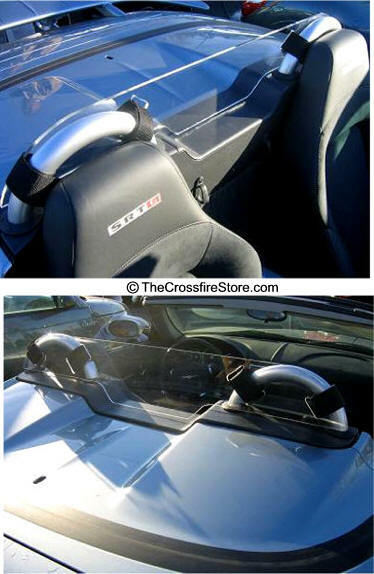 WB-CROSS-FULL-WD 1002 Chrysler Crossfire (2004-2008) Wind Blocker - Deflector - You won't believe you ever drove without it! Great to reduce air and noise in the cabin. No wobble. Our Wind Blockers remain secure when in use. The windscreen does not wobble or vibration when, even at high speeds. - Prevents unrelenting wind buffeting and driver fatigue. 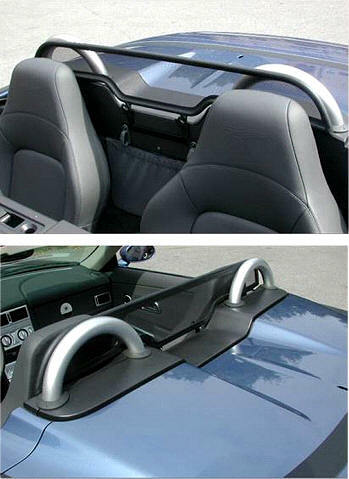 Fulfills the purpose of your convertible, of enjoying the sun while driving about, without getting beat-up by the backwash of wind. - Talk clearly on your cell phone! - Arrive with your hair in place and free of tangles, especially long hair. Woman are it's biggest fans. - Light weight. Very easy to maneuver. - Best for long term wear. This wind blocker will continue to look like new after many years of active service. - Extend the season. Able to go top-down on crisp winter mornings and cool summer nights. - Wives and girlfriends are the number one fan of this product. - Clear, no visual impedance, especially at dusk. 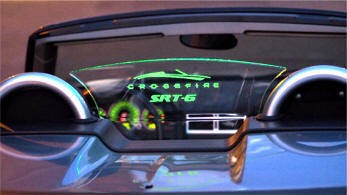 - Carry on conversations with your passenger without straining your voice. - A much quieter cockpit. You'll be able to hear yourself think again. - Enjoy the full richness and clarity of your stereo. - Take long trips comfortably. - Cruise at night without freezing from cold drafts. - Cleans easily with soap and water. - Wind blocker remains in place with top-up. Do not need to take off & on. Can be used in any degree of weather; material rated for -30 degrees to 125 degrees (-35 to 52 degrees Celsius. - Large surface area blocks significant turbulence; excellent performance. - Constructed of high scratch/buff resistant material with gloss finish. Your wind blocker will continue to look like-new many years after regular service. 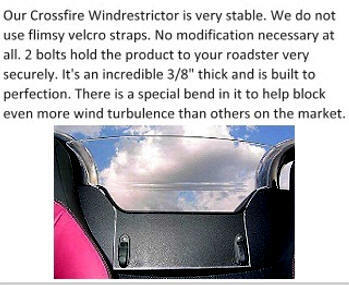 We have customers who've been using my wind blocker over seven years in their car, and their wind blocker still looks great. - Tough fasteners. Customers drive at three digits speeds for hours across Montana with my wind blocker in place. - Mounts slightly tilted preventing night time glare. - Off-and-on in seconds, simplest of installations. - Environmentally Friendly. The material uses polymeric compositions, which means less petroleum is used in the production and manufacturing, providing a higher quality. - Precision. Windscreen is even, square, symmetrical, and balanced. - No permanent modifications for the attachment system; wind blocker installs with no changes to the cockpit whatsoever. No drilling, glues, or adhesives to permanently mar your car. - Scratch Resistant. Made from premium double sided AR Polycarbonate, the best available material in the marketplace for this application. This material carries a 15 year rating to look as new as the day you purchased it. It is scratch and buff resistant, and resists impacts. - Smudge Resistant. This material for this windscreen resists smudges from hand and fingerprints, so your windscreen remains looking crystal clear even when handled. This windscreen requires less cleaning and polishing. 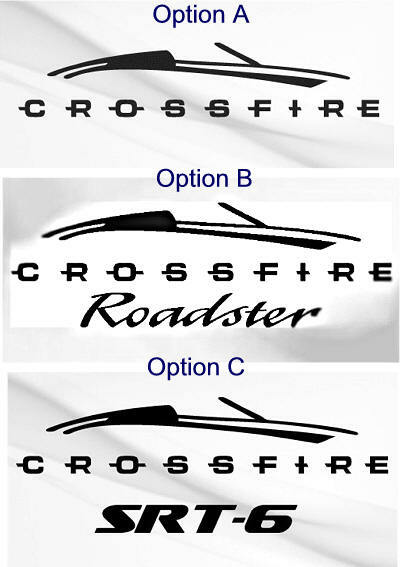 1) Can you leave the windscreen in place while raising and lowering the top? Yes, you can. 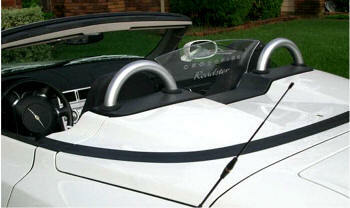 Many customers simply leave the windscreen mounted on their car most of the year. 2) Does the bottom of the windscreen rub against the car? No, the fastening lifts the windscreen up off the bottom to eliminate bottom-side wear, and is cushioned against the car to preventing abrasion. 3) Could the wind deflector chatter when in use? No, the fastening system holds the windscreen very secure to the car. This windscreen is tested to 150 MPH. 4) Is this difficult to install? Definitely not. Elementary age children can install these windscreens. 5) What is the difference between acrylic and lexan? Acrylic is about 18x stronger than glass; Lexan is about 61x stronger. 6) Doesn't acrylic or lexan yellow in sunlight? NO!. 7) Could the wind blocker induce any sort of wear? Never. 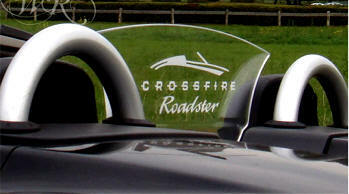 Since the windscreen is secure in place, there is no movement between the windscreen and the car, so there is no wear. 8) How long does this wind restrictor last? With regular care and handling, your windscreen will last the lifetime of your car. 9) Is the tint an overlay film? No, the tint is infused in the material, which resists scratches and abrasions. 10) Should I get a tint? Tinting is a color preference, so it really depends your individual taste; however, the smoke tint is our favorite, and what we use. 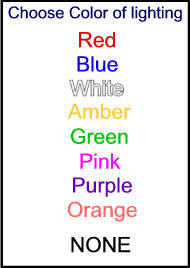 11) Does the tint inhibit rear view vision? No - it's like looking through sunglasses. 12) Does the wind stop cause glare at night? No. 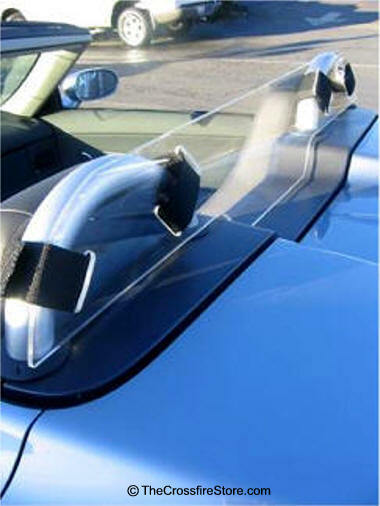 First, the windscreen is made of a specialty glare resistant material. Second, the windscreen mounts at a slight angle, to further cut glare. 13) Does this windscreen interfere with the boot cover? No, it does not. Custom wind deflector made from a single piece metal frame covered with faux leather with a nylon mesh screen. 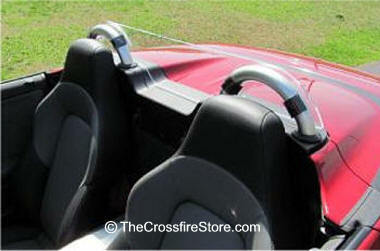 Covers the whole surface between the two roll bars. Mounts easily at fixed points. Top of the line quality. Made in America. - Can be wired to brake lamps, fog lamps etc. *Can order with ILLUMINATION (The only wind deflecting device on the market that has this patent pending feature! You can have the Wind Restrictor Light Kit hard wired to any 12 volt wire of your roadster (fog lamps, brake lights, driving lights, etc.) 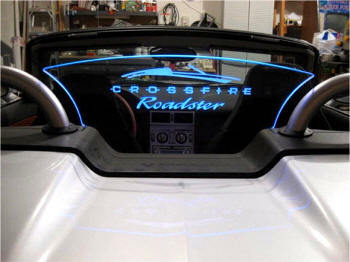 Most car audio/electronic shops or dealerships can wire it or you can do it your self in less than 1 hour. Cigarette lighter plug adapters, or AAA battery packs can be added for an easy convenient connection. 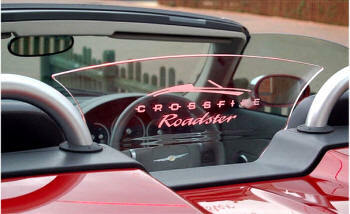 *Can order Laser engraving (Etched with a high powered laser to really make your roadster unique and stand out. The engraving will also emit light and give off an awesome glowing effect with a Light Kit installed. *Installation easy as 1,2,3! (1.- Remove 2-4 screws from your rear panel; 2.- Mount the Wind Restrictor™ into place; 3.- Put extended screw connectors back in place! takes about 5-8 minutes.